Description: Golf at Deer Brook provides you with a country atmosphere, set among the rolling landscape and natural seclusion of northern Cleveland County. 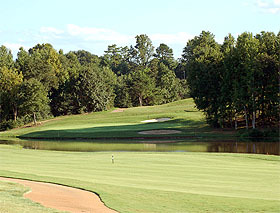 Deer Brook is located in Shelby, NC about an hour's drive due west of Charlotte via I-85 and US 74. The club prides itself on having no "gimmicks" on its natural layout and serving all levels of golfers from amateur to pro. B-Man's Take: I have yet to play Deer Brook but have heard good things that tell me it's worth the trip. I hope to play it soon and post my own review.